Welcome to the second Grenfell Family History e-newsletter. I had planned that this edition would have followed on closer to the previous one – but it was not to be. Still I hope it is better late than never! As you are aware, the newsletter is aimed at those who have a close interest in connection with the Grenfell family and will highlight changes and updates to the Grenfell Family History website, focus on new research and contain other useful snippets of information. Please feel free to share the newsletter with friends and family who you think may also be interested. Following on from the previous Newsletter, 8 additional memorials have been included on the War Memorial webpage. 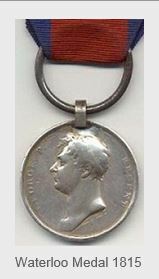 Also with wartime connections a biography for Captain William Grenfell (1795-1857) a recipient of the Waterloo medal, has been added. Plus, a photograph of the tombstone in Paris of Admiral John Pascoe Grenfell of the Brazilian Navy. Baptism, marriage and burial records for the parishes of Gwennap, Ludgvan, Madron Paul, St Just in Penwith, Sancreed, Truro and Zennor have been added. Details of two accidents are referred to and a document ‘Notable Cornish Women’ added. The descendants of John Grenfell & Grace Roach and George Leonard Grenfell & Charlotte Spires were added to the Family Trees. I’m pleased that a Grenfell DNA Project has been established, details of which can be found by clicking the above link. * Discover information to help with our research. * Discover which family trees are related. * Discover information to help with brick walls. Although all family members can take a test, as I have done, ideally it should be the Y-DNA test taken by males carrying the Grenfell name or its variants. This is a harmless genealogy test of locations on the Y chromosome, called markers, which are passed from father to son, typically unchanged. The test result is a string of numbers, and contains no personal information. A Grenfell male will be an exact or close match to those men to whom he is related. By also testing a distant direct line male in the family tree, if possible, it will validate the family tree research to the common ancestor shared by both men who test. Participating is an opportunity to uncover information not provided in the paper records, which will help with the research of your family tree. We will also discover which family trees are related. As the project progresses, the results for the various family trees will provide information about the origin and evolution of the surnames. I do hope that those of you who are males carrying the Grenfell name will join the project by contacting me and that the ladies with Grenfell husbands, fathers, brothers, cousins and uncles will persuade them to join the project! I hope you found this edition of the newsletter interesting and informative. If you have any feedback, suggestions or wish to contribute to future newsletters please let me know. However, if you decide that you'd prefer not to receive them you can unsubscribe by using the link below.